Barbados is the most easterly of the Caribbean islands and has a very high quality of life for a developing country. 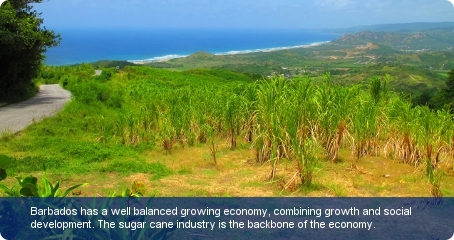 In a little over thirty years Barbados has transformed itself from a single crop culture (sugar) to a well balanced growing economy which combines growth, social development and three main economic sectors: sugar, light industry and services (financial and tourism). It has a GNI per capita of US$15,080 (2012) but has struggled in the last decade to cope with global downturns affecting its tourism. Tourism and travel generate 13% of total employment and contributes to around 44% of GDP (World Travel and Tourism Council, 2011). The country attracts a significant number of tourists from the UK and sells itself as a high-end tourist destination with its numerous luxury holiday packages. The off-shore financial services sector continues to grow and is now the country’s second largest foreign exchange earner after tourism. Barbados has around 1.7 million barrels of proven oil reserves (2011) but quarrying is the dominant form of mining or extraction activity. The clays, shale, sand, gravel and limestone excavated are crucial to the construction industry as this minimises the cost of importing materials like cement. The construction, along with the tourism sector, is a significant source of employment on the island. The main exports are sugar and molasses, rum, chemicals and electrical components. The main import commodities are consumer goods, machinery, foodstuffs, construction materials, chemicals, fuel and electrical components. The USA, UK and other CARICOM countries are its main trading partners. Overcoming the lack of growth caused by world slump in sugar prices in the 1980s and the global recession of the early 1990s by means of structural adjustments to economy, the country managed sustained growth of around 4% per annum from 1994 until the recession in the US in 2000 caused a significant drop in the number of US tourists visiting the island. The subsequent recovery has seen the Barbadian economy claw its way back to an annual growth rate of 4% in 2004/05. But the period 2005-09 saw a GDP per capita growth of -0.4% (0.7% for 1990-2012) with inflation at 6.3% per annum 2008-12. The Port of Bridgetown in the capital is a deep-water port with terminal facilities for cruise ships and yachts. Nearly all of the roads in Barbados are paved ensuring accessibility to internal markets. The Grantley Adams International Airport is located 13 km east of Bridgetown and provides an international access point for tourism and business. The Caribbean state has one of the highest internet usages in the commonwealth and consequently one of the most ICT-savvy populations. Barbados also has a 98% adult literacy rate and English is the national language.